Maine is nicknamed “Vacationland,” as their local scenery draws in a tremendous number of visitors each year. Their crime rate is also incredibly low, another factor which no doubt contributes to the success of their tourism industry. Sadly, you won’t be finding many folks who visit Maine for the sports betting opportunities. The state has a limited number of athletic teams, and those that do exist are often overlooked by bookmakers. That does not mean, however, that the situation is hopeless. 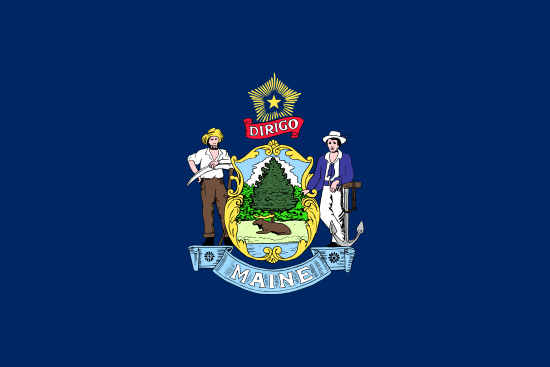 While land-based sports betting is illegal in Maine thanks to the 1992 passage of the Professional and Amateur Sports Protection Act, there are no penalties for residents who choose to do their wagering online. As long as a sportsbook has an offshore license and the bettor is at least 21 years old, there’s no danger of the authorities becoming involved. US-facing sportsbook sites can safely do business with online sports bettors from Maine. Anyone who’s looking to wager on a Maine-based college team had better temper their expectations, as the state only has a single university competing in Division I of the NCAA. NCAA football and NCAA basketball action in Maine is limited to subdivision except for hockey, which the state’s school excels in. University of Maine – Located in the city of Orono, this university was established in 1865 and has a current enrollment of just over 11,000 students. The Maine Black Bears football team competes in the Colonial Athletic Association, while their hockey team plays in the Hockey East Association. All their other men’s and women’s squads are affiliated with the American East Conference. Their greatest athletic accomplishments have come in the sport of ice hockey, where the men’s squad has captured a pair of national titles. While the University of Maine isn’t the only college in the state, it’s the only one likely to receive a betting line from bookmakers. If you want to wager on the outcome of junior college or Division II sports, you’ll probably have to resort to making friendly wagers with alumni or gambling-obsessed buddies. Maine is a U.S. state that lacks a major league franchise within its borders. This makes things decidedly inconvenient for anyone looking to cheer on world-renowned franchises, and most residents wind up following teams in the New England area. • Portland Rugby Football Club – Founded in 1969, this is the oldest rugby club in the state. Their games are often played as part of the New England Rugby Football Union. • Maine Moose Trax – The team hasn’t played a game as of this writing, but they are expected to be part of the United States Lacrosse League once their inaugural season begins. • GPS Portland Phoenix – Based in Portland, Maine, the team plays as part of the USL Premier Development League. • Maine Tide – Founded in 2007, this all-female soccer team competes in the Women’s Premier Soccer League. • Main Sting – Located in Bangor, Maine and founded in 2008, this fourth-tier amateur team competes in the National Premier Soccer League. • Portland Pirates – A minor league ice hockey team that competes in the American Hockey League as an affiliate of the Florida Panthers. • Maine Rebels – An all-female football team that competes as part of the Independent Women’s Football League. • Main Roller Derby – A women’s flat track roller derby league. Their two home teams are called the Calamity Janes and the R.I.P. Tides. • Portland Sea Dogs – This minor league team plays in the Eastern League and functions as a AA affiliate of the Boston Red Sox. • Maine Red Claws – Founded in 2009, this team plays as part of the NBA Development League and has an affiliation with the Boston Celtics. While the University of Maine Black Bears are never much of a factor in the annual NCAA men’s Division I basketball tournament, it hardly diminishes the enthusiasm of local residents when it’s time for March Madness. Local bookies are busy beyond belief, and you’ll find plenty of friendly wagers being made between family members and co-workers. The most popular form of gambling that takes place during this time is known as a tournament bracket. When the NCAA sets the initial 68-team lineup for their tourney, a massive bracket is posted. If you decide to enter one of these contests, your objective is to fill out the bracket all the way to the finals, trying your best to predict the various winners and losers. This is far more difficult than it sounds, as any mistake along the way can play havoc with your overall projections. In most bracket pools, the person with the most correct predictions walks away with all the entry money. In other cases, the top three finishers may all get a percentage of the winnings. This form of betting is wildly popular, and it’s rare to find an office or bar that doesn’t have one of these contests available. The legality of the competition is murky in most states, but it’s such harmless fun that nobody seems to worry much about whether or not any laws are being broken. If you’re lucky enough to win a few of these contests, you can add a nice chunk of change to your bankroll. Online contests are also available in abundance, with sports sites offering all sorts of lavish prizes. The ultimate is a contest that’s been taking place over the last few years with the assistance of investment genius Warren Buffet, as it offers $1 billion to anyone who’s lucky enough to fill out a perfect bracket. Maine doesn’t have many betting opportunities if you’re looking to wager exclusively on local college or professional sports teams. Luckily, bookmakers aren’t limited to offering odds only on hometown teams, and this diversity gives you access to sporting events taking place all over the planet. Since online gambling isn’t illegal within the state, this provides the added advantage of being able to place bets with international bookies without having to look over your shoulder or feel like some sort of criminal.